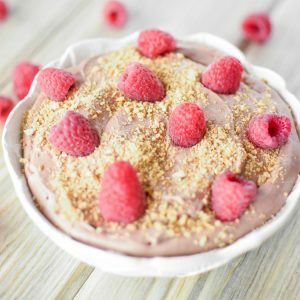 If you’re all about quick and easy, this chocolate raspberry cheesecake dip is for you. You will not find a simpler recipe out there. I promise you this! It is no bake … win. It is chocolatey … win. It combines dessert with your favorite flavors of Spring (in this case – Raspberry) … win. Are you getting the picture? With Easter literally right around the corner, I think this is the perfect dessert to celebrate. With a little bit of time, effort and money, this recipe can be ready in under 10 minutes. It chills well, so you can make it ahead, making it a great take-along dessert. Are you sold yet?! I’m trying here, guys! In all seriousness though, I totally recommend you give this recipe a shot. Oh, and pair it with a barley wine (see below). There is literally no better way to go. I hope everyone is having a great week! I’ve missed all of you! Description: Barley wine-style ales are one of my favorite styles of beer. We were so excited to try this beer, and were lucky enough to get our hands on a bottle just this past week! This barley wine is, without a doubt, one of the best I’ve had. It is rich and robust with extreme maltiness. It gives you those wine-like characteristics you crave with a barley wine. I like barley wines with desserts and cheeses, and it was the perfect pairing for this cheesecake dip. Not only does it compliment the chocolateyness, but it also compliments that cheesiness. That’s like a double whammy of deliciousness! If you are one of those lucky people out there that can get your hands in a bottle, I suggest that you do. You will not regret it! In the bowl of your stand mixer, with whisk attachment fixed, beat the heavy whipping cream at medium-high speed until stiff peaks form, 3-4 minutes. Set aside. In another bowl of your stand mixer, with paddle attachment fixed, beat together the cream cheese and confectioner''s sugar until smooth and creamy, about 2 minutes. Add the raspberry preserves and chocolate, hazelnut spread to the cream cheese mixture and beat again until thoroughly combined, about 1 minutes. Remove the bowl from the mixer and fold the whipped cream very gently into the cream cheese mixture. This will take a couple of minutes of folding. Make sure the mixture is smooth and creamy when all is said and done. At this point, you may cover the dip and refrigerate until you are ready to serve. Once you are ready to serve. Sprinkle the graham cracker crumbs on top and garnish with berries. Serve with graham crackers and assorted berries for dipping. Enjoy! Any party but be lucky to have this dip as a part of the spread! Dip: it’s not just for dessert anymore. Gosh this dip is epic!